Grand Canyon University (GCU) is a private Christian university strongly committed to guiding students to become socially responsible, compassionate servant leaders by making an enduring impact on their local, national and global communities. The university provides both financial support and hundreds of volunteer hours at nonprofit agencies in our community such as the Phoenix Dream Center, Hopefest, American Cancer Society and Phoenix Rescue Mission. In addition, GCU has its own annual signature events such as Serve the City days, Salute Our Troops, Canyon Cares Christmas and the Run to Fight Children's Cancer. GCU is also committed to improving lives in our neighborhood with programs to support K-12 education as well as a partnership with Habitat for Humanity that is the largest of its kind in the country. GCU staff and students are encouraged to look for new volunteer opportunities to support those affected by natural disasters across the country and throughout the world. Do you have questions about our charitable work or the organizations we support? Explore some of our work below, or call 855-GCU-LOPE and request to speak with a member of our community outreach team. Our GCU Learning Lounge has resources to help K-12 students with their toughest subjects by offering free small-group or one-on-one tutoring. Experience the learn at GCU's Learning Lounge. Helping to prepare Christian leaders for a lifetime of faithful ministry, Grand Canyon Theological Seminary equips leaders, ministers and scholars to minister effectively within a challenging cultural context. GCU has partnered with Habitat for Humanity, a nonprofit Christian housing ministry that builds and repairs houses all over the world for underprivileged people, to renovate an entire community of homes in our West Phoenix neighborhood. 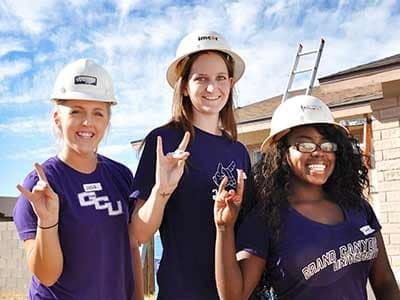 GCU is committing the talent and enthusiasm of students and employees who will pair with Habitat leaders to supply the manpower necessary to renovate as many as 700 neighborhood homes. Repairs may include landscaping, roof replacement, painting and structural repairs. GCU proudly supports the Phoenix Dream Center and its mission to serve homeless, low-income, at-risk youth and struggling individuals and families by providing resources, opportunities and services to help them realize the dream of living a self-sufficient life. 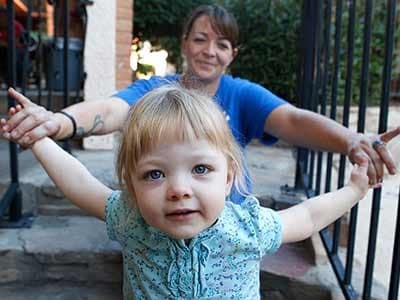 The Phoenix Dream Center needs volunteers to help with their young women’s program Hope Wing. Opportunities include working directly with other volunteers as a supervisor (requires six-month commitment) or as a client advocate for a program participant. Learn more about volunteering by contacting the Dream Center directly. 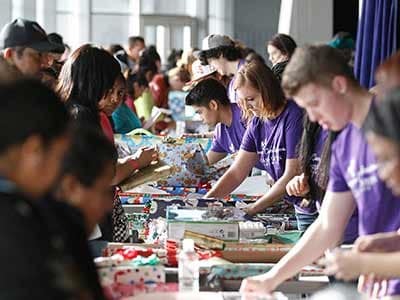 GCU Lopes help wrap toys and gifts from the annual Christmas toy drive. A GCU student helps at Serve the City, one of GCU's many community outreach efforts. A family from the Phoenix Dream Center smiles for the camera. GCU students volunteer at the Phoenix Dream Center. Three GCU students take a quick break during volunteer work with Habitat for Humanity. 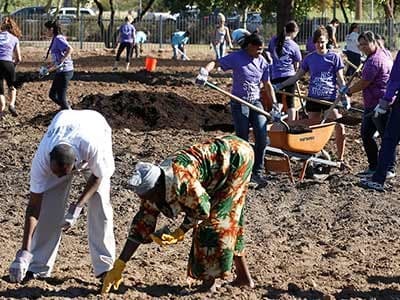 When a natural disaster leaves people in need, GCU students and staff are quick to respond. GCU staff sprang into action to raise nearly $60,000 when devastating earthquakes hit Haiti and Japan. After the 2011 Joplin Missouri tornado struck, the GCU community collected much-needed gift cards, toiletries and clothing. GCU staff then drove the donations directly to victims. Lopes for Literacy is GCU's College of Education-sponsored outreach program that encourages children in neighboring schools to read and develop a passion for books to ensure their future success. Fitness and Nutrition: Focusing on the importance of eating healthy, staying active and getting enough sleep to increase energy and happiness. College Exploration: Helping students imagine future careers and the importance of choosing the right school to fit their needs to have a successful future. Virtues: Anti-Bullying: Teaching children what bullying is and how it can be hurtful. The presentation also shows the importance of being kind to one another. Math and Financial Literacy: Helping students strengthen their math skills while also teaching them the value of money. If you are interested in hosting a Lopes for Literacy program, please call 855-GCU-LOPE. Each Memorial Day, GCU staff members visit the Arizona State Veteran Home and VA hospital to deliver gifts and spend time with those who served our country. This semi-annual event has attracted hundreds of GCU students who volunteer to beautify neighborhoods, like repainting homes and removing graffiti around the GCU campus. More than 12,000 children are diagnosed with cancer in the United States each year. To raise awareness and funds to fight childhood cancer, GCU sponsors a run each March that has raised thousands of dollars to date.